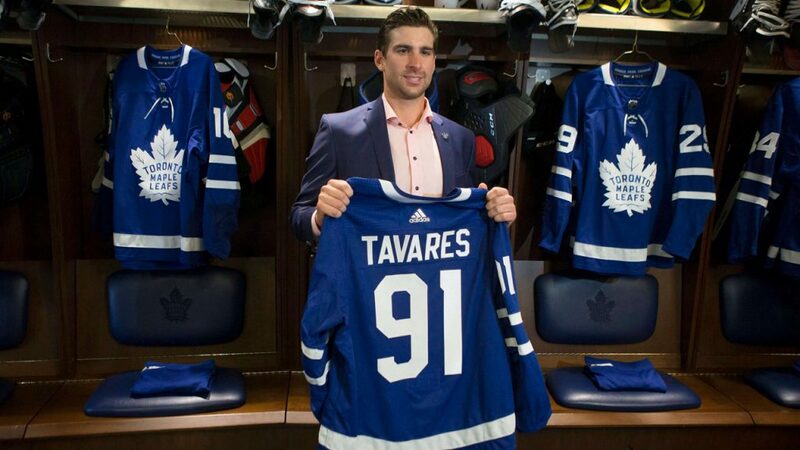 Former New York Islanders’ captain and Toronto area native, centreman John Tavares signed with the Toronto Maple Leafs on a 7 year, 11M AAV deal just this past noon; Finally ending the long speculated #TavaresWatch on Twitter. There were originally 5 teams trying to pry the star centreman from former Leafs’ GM Lou Lamoriello’s hands. Those teams were the Tampa Bay Lightning, Boston Bruins, San Jose Sharks, Dallas Stars and our very own Toronto Maple Leafs. They all got to pitch their ideas to win the sweepstakes 2 weeks ago which resulted in firstly the Islanders offering JT an 8 year, 11M AAV long-term contract. All-though the money and term looks amazing, the team isn’t ready to be a Stanley Cup Contender just yet like what JT was looking for. The Maple Leafs and Islanders made their pitches on June 19th while the rest of the 3 teams made theirs on the 21st. After that, the NHL and other free agents near Tavares’ caliber waited for his decision. On July 1st, around noon. Multiple sports networks announced that the Leafs signed Tavares to a long-term deal. What does Tavares add to the Leafs? Tavares is what you would call a “all around player”. Which means he can definitely play offense, but also play in his own end. Tavares came off a beautiful season for stats nerds like myself to watch. He maybe hasn’t looked good defensively with the Islanders, but remember, their whole team hasn’t either. He recorded 84 points in 82 games played, producing a 1.02 point per game. In those 84 points, he had 37 goals and 47 assists, meaning he’s going to be an offensive threat while setting up whoever his wingers are for more goals on their line. With the addition of JT, the Leafs center depth, and overall forward depth based on development, skyrockets. Just to let you know how high, some betters have placed the Leafs as the highest chanced team to win the Stanley Cup next season. Now, you may ask “With what defense?”, and then I come in and answer, “What defense did Pittsburgh have when they won the cup in the 2015-16 season?”. Teams don’t need their whole defensive lineup filled with multi-million dollar making defensemen. We surely need a top pairing defenseman, but that’s pretty much it. Players like Zaitsev can rebound from bad seasons. As long as your offense produces and limits turnovers/opponent rebounds, then your defense shouldn’t need to be world class level. Follow @ChrisAdamoTTS for Toronto Maple Leafs related content.